Once your landing page is ready to go, you have a few options for actually publishing it. From quick hosting on Leadpages’ servers to connecting your domain, there are ways to publish no matter what your setup is. In this guide, we’ll cover each publishing option and how it works. You’ll find links to more in-depth resources throughout so you can learn more about any particular publishing option. NOTE: If you're looking to publish a Leadpages Site, we have an article specifically for publishing sites here. You can access any published landing page at its Leadpages Domain on our servers at any time. Once you publish a page, it’s not possible to restore it to draft mode. However, you can prevent your page from being indexed by search engines. Some features require you to use your Leadpages-hosted URL, including our redirect option and automatic Pixel installation for Facebook Ads. When you start with a drag and drop template, your page will stay in Draft mode until you hit publish. Here’s how to publish a page for the first time. Open your page in the builder. 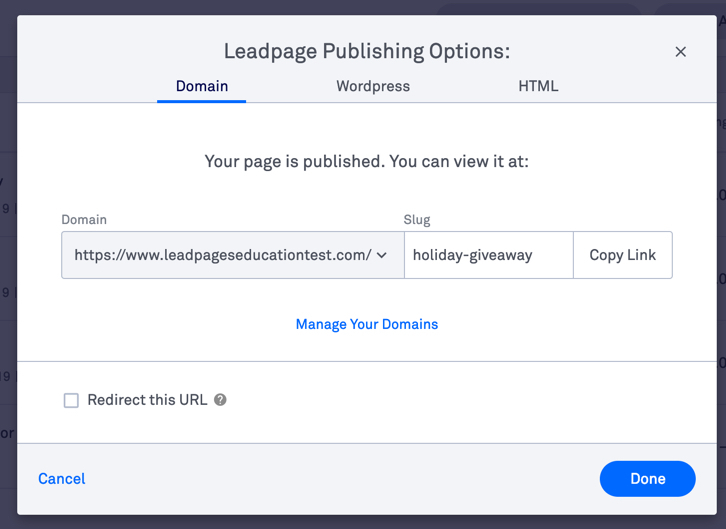 Choose to publish your Lead Page to a connected domain or your Leadpages Domain, then click Publish. After your page is published, you’ll see an Update option instead of Publish. From the drop-down menu, you can access lots of page options, including your publishing settings and the option to revert back to the last published version. Standard pages do not have a draft mode. Saved pages are automatically published at your Leadpages Domain—but you can always prevent them from being indexed. You must give your page a name and configure integration settings before saving or publishing your page. Unlike our drag and drop pages, you must explicitly save and publish your page for your changes to go live. To get your page’s URL, click the down_angle button next to Update in the top-right corner of the builder, then "Publishing Options." Your page’s URL will appear in the publishing modal. From there, you can view your live page and copy or edit its URL. You can also access your publishing options from your account dashboard by selecting Lead Pages, then, select “Publishing Options” from the action menu more of the page you’d like to view. You can change your page’s domain to a domain you own if you’ve connected it. You can change your page’s slug to make sure it’s memorable and relevant. Keep in mind, you must choose a unique slug; no two pages can have the same URL. NOTE: If you’d like to change your account's Leadpages Domain, let us know—we can happily change it on our end. TIP: Only certain characters are allowed for page slugs—if you have invalid characters, click Fix it for me to automatically convert to a valid URL. Beyond publishing pages on our servers, you can also publish pages on your own site or domain. To publish to a root or subdomain you own, you can connect your domain to Leadpages by following these steps. If you use WordPress, our plugin is the easiest way to get pages up-and-running on your site. To learn how to install and use the plugin, be sure to check out our WordPress Publishing articles. There are a few options available if you don’t have a WordPress site. One option for publishing to your domain is to connect it to Leadpages. That way, you can publish pages without the need for your own web host, but you don’t need to use the lpages.co domain. Check out Publish Pages as HTML for full details. Is it possible to redirect a page to a different URL? What happened to the Facebook Tab publishing option? We now recommend posting a link to your Lead Page on your Facebook Page’s Timeline or as an ad.